Sometimes it is not possible to gain access with a portable sawmill or it is simply not viable becasue the tree being felled is not large enough for it to warrant a portable sawmill being brought in and set up. 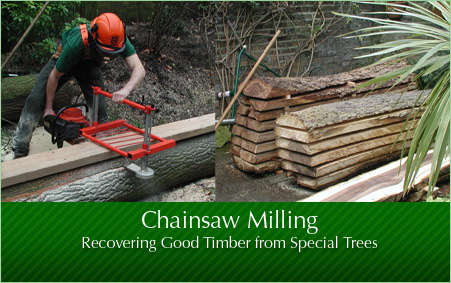 However there are occasions when a smaller tree with a straight trunk can be milled using a large chainsaw with a chainsaw planking attachment. 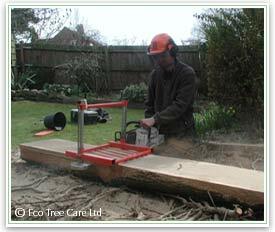 This is quite simply a large powerful chainsaw with some slight modifications allowing the addition of a planking attachment. 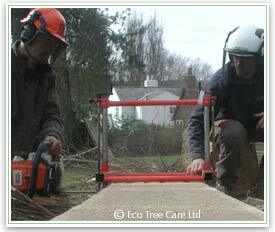 The chainsaw planking attachment fits onto the bar of the chainsaw and effectively fixes the cutting chain at the required depth. 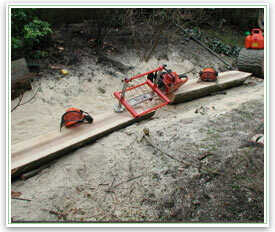 This is done using a chainsaw. It is always a good idea to check over the trunk for any metal before starting. 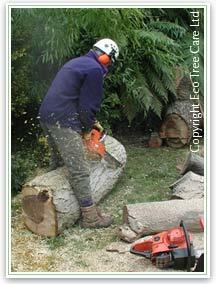 Especially with trees that have been felled in back gardens. It is quite common to find nails and hooks embedded in the wood. 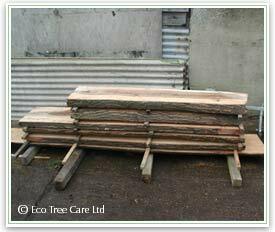 Look out for staining in the wood, especially in tannin rich species, such as oak and sweet chestnut. Iron will leave a dark blue-black stain that travels vertically up and down in the xylem and phloem vessels. Alternatively some people use a ladder to give the straight edge. Whatever the method the 'straight edge' must be secure and not warped or twisted when it is attached. A spirit-level can be useful to check how true it is. The photo shows a scaffolding plank that has been attached with long nails through pre-drilled holes. Calculations have to be made to ensure that the first cut is deep enough not to hit these nails. 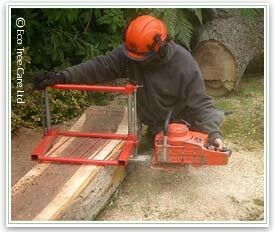 Now that the section of wood has a flat surface the process can be repeated over and over again. 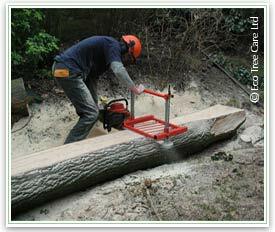 The chainsaw planking attachement can be adjusted to guide the chainsaw to any depth below the flat surface, thus any thickness of wooden plank can be created. 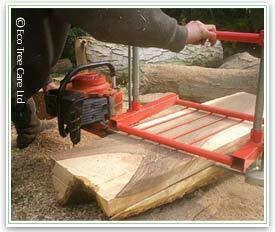 The result is useable, beautiful timber. 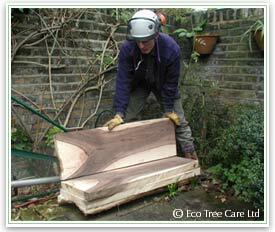 Some of the examples above show the chainsaw planking of a dead walnut tree in South West London. 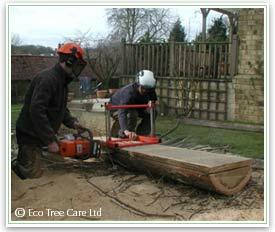 We were sourced by a local tree surgeon to help him with one of his long-term clients. 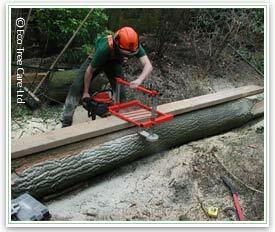 This is a technique that is particularly useful for special trees. 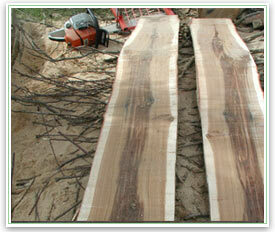 It is a labour intensive operation but does yield good quality planks that could go onto be converted into furniture. 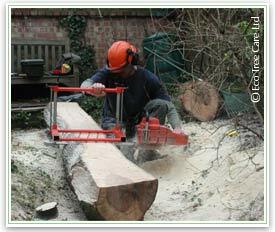 From a cost perspective it does add another days labour and therefore cost to a tree surgery operation so tends to be reserved for clients that have a particularly sentimental or important tree that has to be removed for whatever reason, and who have plans for the timber. In this case with the walnut, the family who owned the tree had a fine furniture maker as a friend who had already designed the table that this was to be made into. Some of the photos above show an oak that once stood in a back garden of a house in Stapleford, near Hertford. It had to be felled as it was showing signs of terminal decline. The interior of the wood shows the staining typical a fungi called Fistulina hepatica (Beefsteak fungi) which is what furniture makers term, 'Brown Oak'. It is a highly prized wood for such purposes. 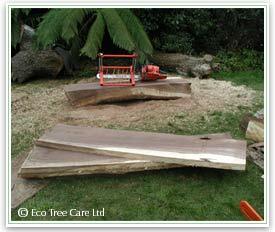 The result of this tree surgery and subsequent chainsaw planking was a beautiful hand crafted table for the family.